Mix all ingredients in a bowl; fold in cooked and drained noodles. Bake at 350°F for 20 minutes or until bubbly. 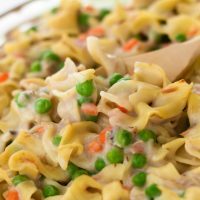 If your family doesn’t care for tuna, you can substitute cooked chicken (either canned or from your freezer stock) for this dish, or you can add more vegetables and omit the meat altogether.